Elmsavers is the recognised leader and innovator in the field of tree injection and the only company to offer a 2-year, or extended guarantee with this method. Also known as micro-injection, trunk injection or tree vaccination, this method involves directly injecting insecticides, fungicides or both into the actual tree trunk. Chemistries are delivered into the sapwood or active xylem where translocation disperses the solutes to the leaf mass. While the injection process can be undertaken throughout the year with equal effect as an insecticide, the optimum treatment period is during the autumn months. This allows ample time for the therapeutic effects of the Neonicotinyl insecticides to improve tree health for the following spring. The tree injection method has a higher level of active ingredient available in the canopy, ensuring a superior level of control compared to soil injection. The chemistries are also highly stable within the tree compared to soil injection. What are some of the benefits of tree injection? The public perception of tree injection is positive and the treatment is scientifically proven to improve tree health and induce systemic acquired resistance. Tree injection is now regarded as “Best Practice”, and very low risk, as pesticides are internalised and sealed. Tree injection is the only method allowing for precise dosage and delivery of pesticide and uses lower levels of pesticide, below Label Rate. Tree injection requires NO WATER during application, whereas a tree with a 100cm diameter trunk requires 92 litres of water if soil injected. Treatment is not limited by seasonal changes, and will work effectively in 8½ minutes in +28ºC and in 6½ minutes at 35ºC and above. Whereas soil injection square meter application rate EXCEEDS the label rate for in-furrow applications (the (Withholding Period) for in furrow applications is 21 weeks for grazing). Tree injection is the only reliable long term control, available in all conditions and year round, and has higher levels of available active ingredient that is fast acting and persistent. 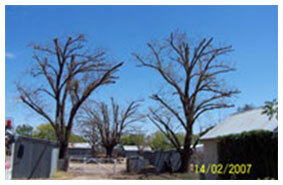 Risk of insecticidal resistance development is greatly reduced using tree injection treatment. 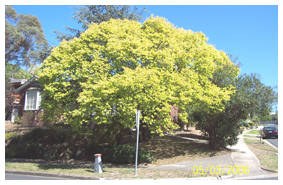 Tree injection is the most environmentally-friendly method known and is ideal for all environment situations. The tree-injection sites are also sealed to avoid pathogen entry, while environmental contamination is negligible. Tree injection has no residues to contaminate groundwater and bores. No risk of leaching during periods of high rainfall – contaminated surface water has the potential to reach waterways killing aquatic invertebrates. Tree injection will not kill earthworms and other beneficial soil invertebrates, and won’t affect soil biology by harming beneficial soil fungi essential for nutrient uptake. Safe around children, pets and riparian situations. Complies with, and exceeds OH&S standards compared to conventional treatments. Tree injection can protect elm trees against damage and defoliation for two or more years, and treatment is fast, efficient and inconspicuous. 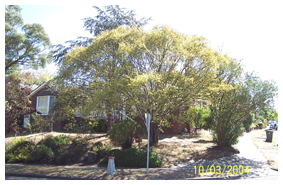 Read more about Elmsavers’ tree injection treatment and processes.